The castle as we know it today was mainly built by the Normans. William II laid siege to the castle in 1095 AD but without success in spite of the revolt being supported by its owner, Robert de Mowbray, Earl of Northumberland. Robert's wife continued to defend the castle until forced to surrender it after the King threatened to gouge out the eyes of her husband who he had captured. After this time, Bamburgh Castle came into the ownership of the English monarchy. 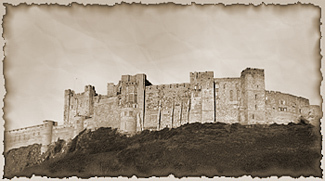 During the Wars of the Roses, Bamburgh Castle became the first in England to be defeated by artillery attack, this being after a nine-month long siege by the 16th Earl of Warwick, Richard Neville. The Northumbrian Forster family became governors of the castle successively for 400 years until ownership was granted to Sir John Forster by the Crown and then the Forster family kept ownership until in 1700 AD at his death, Sir William Forster was declared bankrupt. Because of this, his estates including the castle was sold to the Bishop of Durham. The castle eventually fell into disrepair over many years but during the 18th and 19th centuries restoration was set about by various owners. Eventually, this wonderful striking mediaeval castle was bought by wealthy Victorian industrialist, William Armstrong who more or less restored it to the condition in which we find it today. It goes without saying that with such a colourful history, the castle has more than enough reason to be haunted. Several visitors have felt a ghostly tap on the shoulder on the flight of stairs near the library. There is also said to be a 'Pink Lady' who haunts the castle. She was apparently once a Northumbrian Princess who wanted to marry her true love who was clearly beneath her station. Apparently her father sent her lover overseas and after a period of time when the poor girl became depressed, he thought it would be a good idea to tell her that her lover had married someone else and that she should forget all about him. In an effort to cheer her up in her obvious melancholy, the King is said to have had a beautiful pink dress made for her but unfortunately when it was completed, she is said to have put on the garment then climbed on to the highest battlements and thrown herself to her death on the rocks below! Legend has it that the princess returns to the Castle every seven years in her pink dress, wondering throughout until she makes her way down the rocky path to the beach only to stand watch waiting longingly for her lover to return.